Ship in a Bottle is the 12th episode of season 2 of the American series: Star Trek Next Generation, aired on 25 january 1993 by Paramount Pictures. 55 min. This episode is a sequel to episode 3 of the same season : Elementary, My Dear Data but it is less sherlockian than the first one, because Holmes and Watson only appear at the beginning of the episode, with a nice set at Baker Street and some good deductions. But after that opening, Moriarty is the only sherlockian character left. This one is quite soft, less machiavellian and more romantic with the countess. Four years after their first encounter with Professor Moriarty, Data and Laforge endorse again the roles of Sherlock Holmes and Watson in the holodeck. A bug in the program nevertheless forces them to stop the program. Barclay begins repairing and sees Professor Moriarty appearing. The latter explains that he is real and that Captain Picard had promised him he could have a life outside the holodeck. He success to go out of the holodeck. Dr. Beverly analyses him and the impossible is true, the virtual character became flesh and blood. The professor now want to leave the ship and asks the captain to give life to the Countess Regina Barthalomew with which he is madly in love. Picard decides to postpone any decision. Impatient, the professor then takes control of the ship and threats the crew of total destruction. 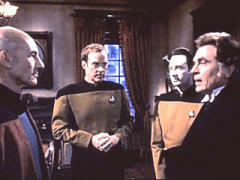 Experimenting teleportation from holodeck to the ship, Data realizes that in fact he, the captain, Laforge, Barclay and Moriarty are still in the holodeck in a simulation of the ship. To survive they tell Moriarty he can leave the ship in a shuttle but caught in his own trap as it is only a simulation, the professor is captured in a memory of the holodeck. This page was last edited on 4 December 2017, at 23:34.